More often than not, when living in Switzerland, you'll be invited to, or host, a luncheon party rather than a dinner party. The Swiss like to stick to the old ideas that "the early bird gets the worm," and "early to bed early to rise, makes a man healthy, wealthy and wise" and so on. In line with this thinking, they're not going to make a habit of staying out late. Dinner parties all too often mean cranky children who stayed up too late, but not when you have a Swiss luncheon party! When you have young children, there is one word for this: Awesome. More Swiss perfection and the one time we screwed it all up, after the jump! The Swiss Luncheon party follows a strict rubric every time. When your guests arrive, the food is warming and finished. This is totally doable because they will show up perfectly on time, or at maximum, one or two minutes late. The table should be fully set before the guests arrive. Everything is ready and the doorbell rings! After everyone has removed their coats and shoes and exchanged hugs and kisses (three cheek-to-cheek air kisses!) you pop open a bottle of bubbly. It can be champagne, or cava, or prosecco, but it's bubbly. Bubbles in hand, everyone relaxes and chats either in the living room or on a balcony if you've got one and the weather allows. Depending on what you're serving, you may or may not decide to have some snacks or appetizers. 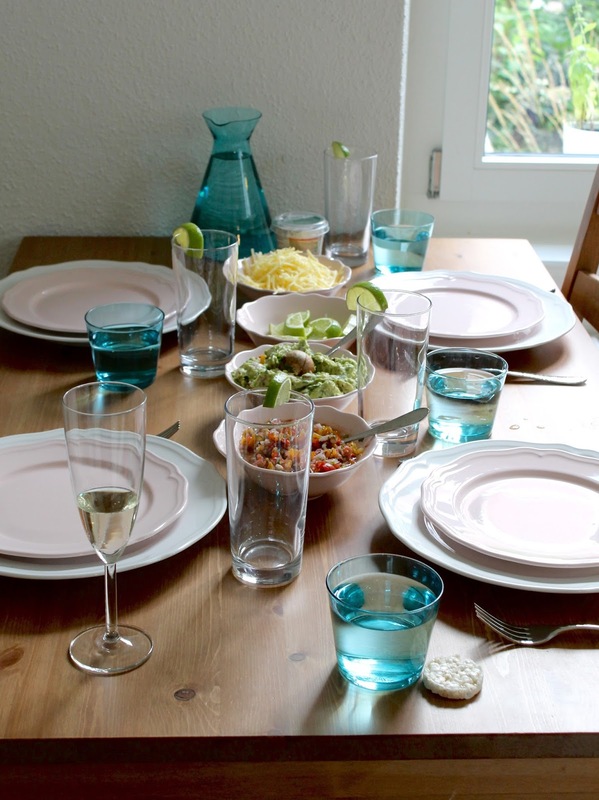 Once everyone has finished their aperitif, you make your way to the table and eat. Typically, your guests will bring dessert. 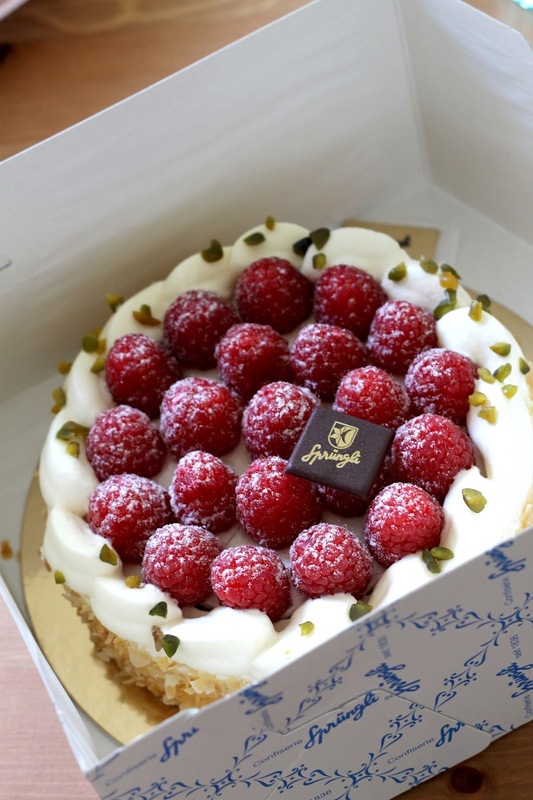 How ridiculously gorgeous is this cake from Sprüngli? Oh my goodness! It's just perfect. I really do miss that place. Everyone will have coffee, tea, or espresso with their dessert and then after a bit more chatting perhaps, it's pretty much over. Your guests leave amid more hugs and kisses and then you have your whole evening ahead of you. It's quite lovely. That is the ideal, anyway. We hit every mark on the rubric when we had friends from our birthing class for tacos, as pictured above. But, one time we hosted friends for lunch and screwed up absolutely everything! The doorbell rang and the food was very much still in progress. Okay, I had just started cooking. 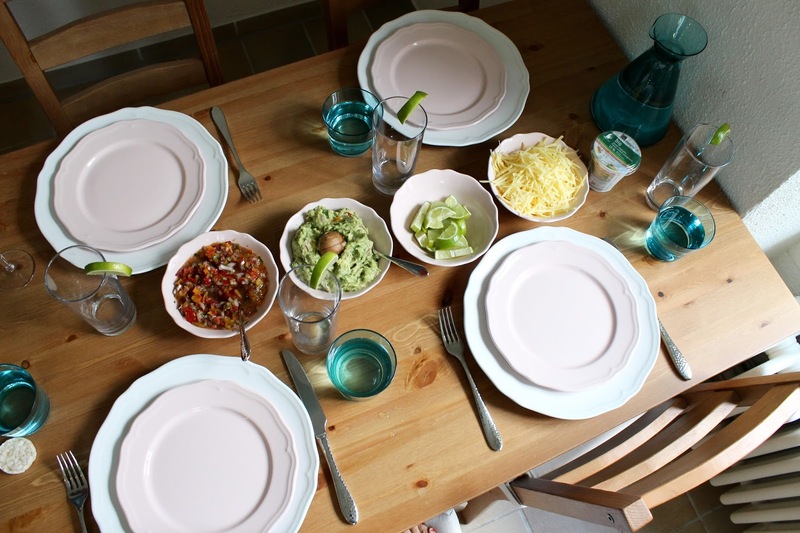 We always made Mexican when we had friends over because we missed Mexican food and loved any excuse to make it and there was no good Mexican to be had in Zurich, so we enjoyed showing people what real Mexican food tastes like. That was great, except we had to make everything from scratch, even the salsa and enchilada sauce! On this particular occasion, J tried to be the charming host and attempted to usher everyone into the living room while I frantically made enchilada sauce from Italian passata, but it didn't work. Our guests had brought a gift for Coco, which they wanted to watch her open, and I couldn't miss that! Then, they wanted to chat with me, too, during the bubbly stage of the plan. Luckily, we knew them quite well, so we all piled into the kitchen and I chatted with them while I cooked. But, that only lasted for so long. Their kids got super hungry because naturally they had arrived hungry. And then Coco got into a foul mood and threw a glass that she grabbed off the counter onto the kitchen floor! Unlike American kitchens, Swiss kitchens always have hard tile floors instead of linoleum. It is not the least bit forgiving. The glass shattered into a billion pieces that flew straight up and all over the kitchen. Oh my god. I couldn't tell if shards of glass had flown into the chicken I was shredding in a bowl. I just looked at everyone thinking lunch was a total bust and said as much. But they just laughed and reassured me that it was probably fine. Then they asked for a plain flour tortilla for their starving daughter, which she munched on happily as I slid the enchiladas into the oven. It was such a mess, but finally lunch was served! When we got to dessert, everyone was too full of enchiladas, rice and beans. Being American, and particularly without the dessert, I didn't think to still serve coffee without fail after a meal. So then our poor guests had to ask for espresso! Fail number I-lost-count-a-while-ago. Ugh. It was so embarrassing, because it's supposed to go like clockwork every time and we pretty didn't do any of it right. Live and learn, right? Being naturally a bit of a hot mess, I have to be deliberate about organizing things. When I was about 10 or 12, I would always run out of hot water in the shower because I would be singing and dancing and daydreaming, and by the time I washed my hair, I was stuck rinsing with cold water! After this happened lots of times, my mom basically gave me a list to get out of the way first thing so that when the water ran cold, I could just jump out. That list, as you might imagine, went something like this: shampoo, conditioner, wash, then you're free to prance and daydream. The beauty of the Swiss Luncheon being the same at every single house we went to was that it gave me a similar list for entertaining. Once we had that list, all we had to do was follow it! Are you naturally talented at entertaining? What is your go-to formula for a dinner party? Or lunch party? Or similar? Please chime in in the comments below! It sounds remarkably similar to a British lunch, especially Sunday lunch. Table laid, cooking done, possible appetisers, bubbles. The only major difference is the dessert- I wish that was a thing here, but I guess in a country with no indigenous patisserie heritage and a thing for home baking it will never be! I love lunch with friends or family, especially now we have S. She is almost universally in a better mood at lunch than dinner too! I could do without the dessert, honestly! Unless I'm guaranteed a nap. ;) British Sunday lunch sounds delightful. I've been meaning to make Yorkshire puddings for a while now. I'll let you know how they go! Sprüngli cakes... how I miss those! Speaking of well-prepared Swiss meals, we were once invited to brunch at a Swiss friend's house. She actually made Zopf from scratch. It was still warm when we sat down to eat. And we showed up at their place right on time. Of course, it helps that we planned our arrival with the ZVV website. As for entertaining, I recently hosted a brunch where I actually had the table set before our guests arrived, but they ended up being 20 minutes late. I absolutely LOVE this post, Lindsey. You are so charming and adorable, even (and probably especially) when chaos ensues. Thanks for the laugh and the inspiration for what appears to be the best luncheon strategy ever. P.S. That rice cake on the table! Oh my heart.